When shopping for a computer, there's always that nagging little fear that says, "Wait a little longer." It seems that if you buy today, the price will go down 10% tomorrow, or a new model that is 100 MHz faster will be announced for the same money. Of course, with that kind of thinking, one might end up forever waiting for the perfect computer at the perfect price. I bought my first G3 in March, 1998. It was (and is) a beige G3/266 MHz minitower that serves as my primary home computer. I purchased my second "G3," a Power Mac 7500 in December, 1998, and upgraded it with a Newer MAXpowr G3/250 MHz card for use at school. Both have performed admirably with almost nary a hiccup along the way. Both are obviously upgradable to more powerful chips. Both have an Orange Micro PC card to provide full-speed Windows computing. And both are equipped with zip and floppy disk drives. Before I switched over to the beige G3, I did most of my home computing on a Performa 575 that I upgraded with a DayStar PowerCard 601 to a PowerMac 575. While I still occasionally use that machine for testing software, it remains in regular use by our youngest, who now refers to it as "my computer." The purchase price of the beige G3 was considerably more than a comparable Blue & White or even a G4. I'll be sending Apple Educator Loan Advantage a monthly check for some time to come for the beige G3. For the same money, a newer model would be fully paid by now! There continues to be a strong upgrade market among Macintosh enthusiasts. Some folks upgrade existing machines, while others invest in used Macs to upgrade. For my school Mac, I obviously chose the latter route and upgraded it with new and existing parts. 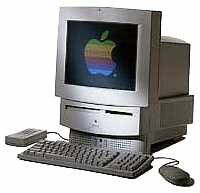 Had Apple still offered their education-only G3 All-in-one (Artemis), the nod would probably have gone to that way. Many other folks for reasons other than pure dollars have made similar choices. Charles W. Moore detailed how a professional photographer eschews the new Macs. The wedding photographer makes a convincing case for staying with the Power Mac 9500 with its onboard SCSI, 12 RAM slots, and 6 PCI slots for high end work. When the beige G3 series was introduced, there was (and still is) considerable clammer about the lack of a true high-end Mac with adequate RAM and PCI slots. For me, that wasn't really a consideration (Remember, I do write for Low End Mac :-). The pricing for the "best" Macs plummeted from around $4,000-5,000 to around $2,500. Having long before received the required "marital approval" for a new Mac, I never looked back and took the plunge for my G3. Although the new pricing of the Blue & White G3s about broke my heart, at around $1,600, I'd already had ten months use from my beige model by the time of that price break. Along the way the beige G3 has received a few upgrades. With the advent of some excellent prices on PC 100 RAM used by some of the newer Macs, I popped for a 128 MB chip to push memory to 224 MB. The 100 MHz SDRAM works well in my beige G3, but I'm also at the point where with each upgrade, I'm removing a chip with nowhere to go with it because of the 3 RAM chip slot limitation on G3 Power Macs. When the stock 6 GB hard drive was getting crowded and beginning to make some new noises, I chose a Seagate Barracuda ATA/66 28 GB drive to replace it. Since my G3 has a revision 1 motherboard that does not support slaved drives, I couldn't use the old drive along with the new one. I haven't as yet popped for a chip upgrade for several reasons. I once read something by a guy named Dan Knight that said you really ought to be able to double your chip speed to get your moneys worth out of such an upgrade. Since 266 MHz times 2 currently equals nothing on the market, I've sat tight waiting for something that comes stock (not overclocked) at better than 532 MHz. As I wait, I also keep seeing delicious rumors such as this one that appeared on MacOS Rumors March 21, 2000. Word from IBM now places the likely release of 600 MHz G3 upgrades to the consumer marketplace within six weeks, and release of at least one Apple product based on the chips by June. Third-party upgrade developers mention that they have been provided a few chips for testing purposes more than once in the past several months, but have still not received official word on when they will be able to ship 550-600 MHz upgrades. In general, their estimates were similar to those of IBM sources - about six weeks. Numerous readers have sent emails detailing fantastic deals on 450 MHz upgrades. While I may yet settle for something less than my target speed, my second reason for not upgrading is that I'm waiting until faster upgrades become widely available and further drive down the prices on 450-500 MHz upgrades. A third reason for not upgrading as yet is that I can't out-type 266 MHz. For that matter, I really have to work at it to out type the chip speed on a Mac SE! I'm not a big gamer, nor do I run any monster number crunching applications, so the 266 MHz satisfies my needs, even when doing light photo editing. Of course, with that kind of reasoning, I should be content with 266 MHz forever. Don't believe it for a minute. What have I missed by staying with beige? This column, like many, has been on my hard drive for some time (creation date 9/8/99). While the new Power Macs have added an array of improvements not present in the beige G3 series, until this week only the 100 MHz system bus even remotely tempted me. FireWire and USB have also added to the Mac's versatility, but really weren't things I needed or wanted. That changed a bit this week with Apple's release of iMovie as freeware! I don't even own a video cam, but I've already downloaded iMovie and plan to at least borrow a video camera. Now, there's just that FireWire requirement. What has been lost with the new Macs? Call me archaic, but I want my floppy drive - and I want it integrated in the Mac. I still find an internal floppy the easiest way to move a driver, a control panel, or one or two files from this Mac to that one. Yes, I have the school's Mac server sitting in my classroom. And yes, all of my classroom Macs are networked with ethernet. When I move our weekly SpellTutor files, usually about a 6-10 MB transfer, I always use the network (if it's up, and it usually is). But for transferring just one small shareware or application, nothing beats a floppy and sneakernet. Just today, the whole network was down. Usually in such cases when the Evil NT techie's server goes down, our Mac server continues merrily serving files and apps and directing print jobs. Today, it was all down, and I had to move a SpellTutor file from my Mac to all of the others in my classroom. Hooray for the floppy! It saved the day. The techie is still denying all:-). Just for the fun of it, I pulled the product description of my now aging beige G3 and a comparable Apple offering of today. Apple muddled for years with some so-so hardware and software at the expense of the faithful. Then folks began to leave in droves. The death spiral was narrowly escaped with System 8 - followed by the G3s and the iMac. Now, as more speed and features are added to the Mac, it might be easy to sit and wait for something bigger and better before jumping into a new Mac. Certainly, watching for possible new model introductions is always prudent. However, from my experience with my now "outdated" G3, I can say it was probably best for me to buy beige despite the downward trend in prices of newer Macs. I may need to upgrade further, or even step up to a G4, or better yet, a G4e, but the increased productivity over the time I've had the unit outweighs any added features or cost differentials. Besides, my beige has a floppy!